Costco, Walmart, Trader Joes and other supermarkets in the US sell 1 to 5 kilo bags of OUR frozen mango, pineapple and other frozen fruit that is processed in Queensland and sent overseas. So many US green smoothie fans always mention using this in their recipes online. Coles Woolworths Aldi etc have ignored all of my emails/ph calls etc trying to find out why they don’t /won’t sell frozen fruit here and some frozen fruit distributors (eg The Berryman ) I’ve contacted have first told me about what I can buy from them in bulk- (they have kiwi/passionfruit/guava/mango/pineapple etc and purees too) and then when I push them for answers say they would prefer not to deal with the big supermarkets…. The Berryman in Brookvale Sydney directed me to a local distributor in Queanbeyan (Priam) near here who said I could buy frozen mango at the organic butcher (!!) at the local markets- $20 for 13 mango cheeks and you have to chop first before blending…not sure why this is so hard to do! So I’ve run out of ideas- sick of leaving my dailygreenbar card with buyers in every supermarket I go into, explain why and what etc and get no response. Of course you can always get online and order in bulk from Queensland…mmm don’t think so and yes of course in season you can buy fresh and process and freeze yourself but I’m thinking of time poor people who want/need quick healthy, tasty, simple options and be able to buy this at their local supermarkets. Once again regarding supermarkets it’s all about money and not about choice and promoting a healthy food- think about the ease and convenience of being able to use frozen tropical fruit in our green smoothies out of season and all year! The only product I could find vaguely resembling frozen fruit were these Smoothie Cubes made by Creative Gourmet ( the pricey small box frozen berry people) They come in these combos Breakfast/Tropical/Berry/Strawberry. Breakfast combo has LSA,banana,honey,oats,apple and cinnamon. Berry Antioxidant tries hard with banana, blueberries, raspberries, goji berries, LSA, chia paste. Strawberry-banana, strawberry, apple and chia paste. Tropical- banana, passionfruit,mango, pineapple and apple. The best combo I think-what we NEED combined in KILO packets and not processed into small cubes like these and sold at $6 for 300gms. It’s too easy to use a whole box in the blender as they are really small and on every box- Just Add Milk! Mm no thanks! The MORE people start demanding frozen fruit in our supermarkets the more they’ll take notice. Costco is building out at the airport here-near where I buy my kilo pkts of frozen strawberries, raspberries, mixed berries and blueberries from the SupaBarn warehouse. The Costco guy I spoke to in their just opening Melbourne store said it may be a money/ manufacturer/ distributors issue. So Aust growers are selling their product overseas for more than what they get from the big supermarkets here?! He was from the US- knew exactly what I meant and found it strange that we can’t buy here. He used frozen fruit in his smoothies- not green but may have another convert! in the morning when he was at home in the US. He suggested when a Costco opens near you to write your “product idea” on the suggestion board near the front door. OK- will be down there every week with the biggest texta I can find!!!! Would love ANY ideas you can come up with people. Thanks!! …get evangelising…! 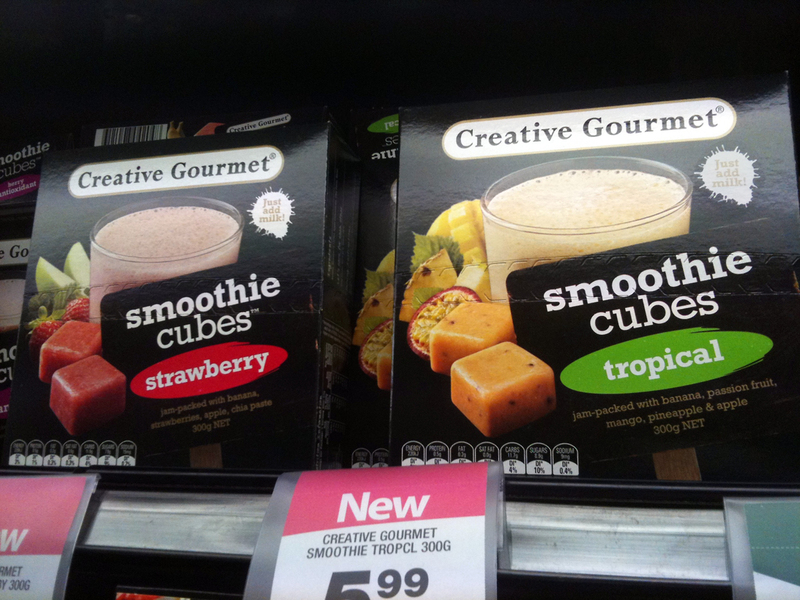 Have a look at what I discovered in Woolies at Brookvale in Sydney. 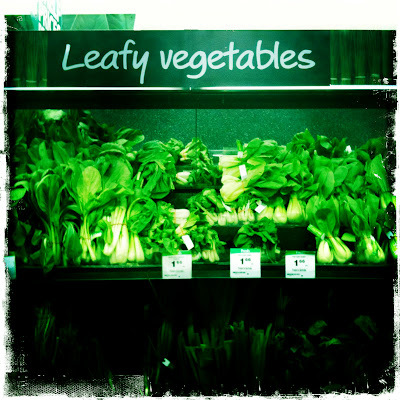 Leafy greens finally get recognised as a separate food group to vegetables and fruit under their own sign in the fruit and veg section! 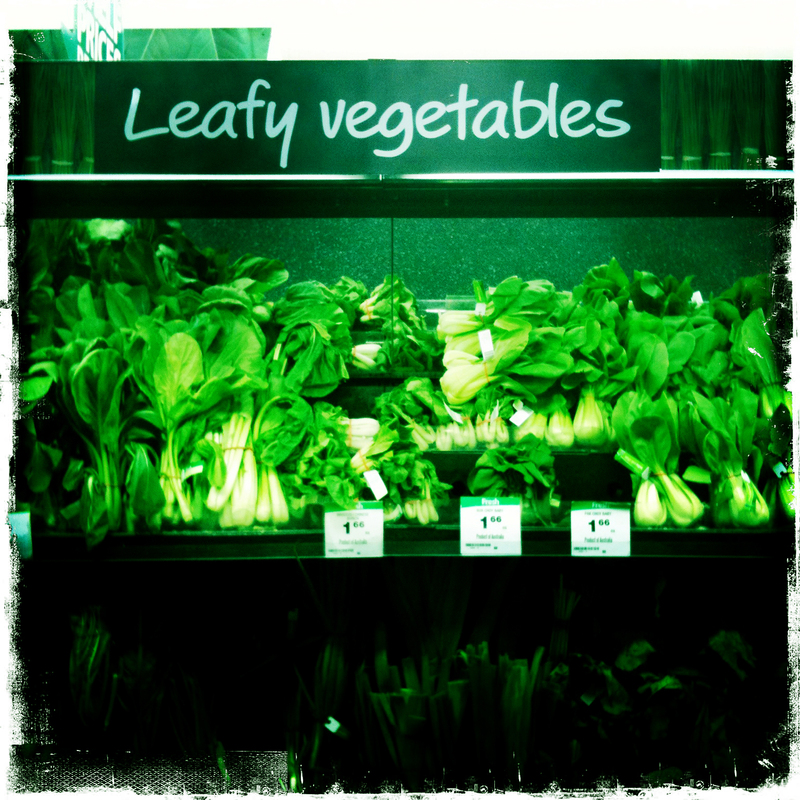 Two shelves of gorgeous leafy greens. Leafy green carrot tops, beetroot greens and radish greens here too. Exciting to see them all brought together like this. Greendar going off! All they need is some green smoothie recipe cards! Great Woolworths-wow I actually put great and supermarket in the same sentence! Because we’re continually told to eat leafy green vegetables to put them all together in their own section like this is great marketing and the educational/awareness aspect is wonderful. “Oh so that’s a leafy vegetable” etc but I guess without green smoothie info the beet, radish and carrot greens are ending up in the bin or compost…! Meanwhile if you are on Twitter I send out links to great articles I read that have green smoothie/nutrition/health relevance and info and recipes. Like yesterday- I came across Martha Stewart’s GreenMachineSmoothie recipe-yes even Martha Stewart! Haven’t tried this but looks a bit watery… but the avocado makes it creamy… and only one cup of greens. Plus I don’t bother peeling my apples and I use all the seeds too- just watch the peach pits! About a week ago I kept finding small rocks in my smoothie and then a bigger one at bottom and realised I’d accidently blended 2 peach pits. Oh so that’s what all that noise was! I actually started feeling a bit strange a while after and started Googling- (cyberchondria!!) then rang the PoisonsInfo hotline as peachpits contain arsenic.The really helpful guy (didn’t think I was strange at all drinking blended spinach!) said I didn’t eat enough of them and talked me out of feeling like I’d been poisoned! So watch those peach pits- not healthy for your blender either! I had a great day yesterday at the Harvest Festival here in Canberra helping out at the Vege stand and talking to people I met about green smoothies (what else!) and giving away and running out of cards. Hi all you newbies if you are here for the first time. People are SO interested in learning new simple ways of eating healthy basic food. You can’t get more basic than greens and fruit eg a green smoothie! I bought 2 bunches of kale and some cucumber from a local organic grower at the festival for this morning’s smoothie-but had run out of lemon/coconut oil/ginger and had no other fruit/berries other than frozen banana plus chia so I realised how much green smoothies need lemon juice and half a lemon skin AND ginger…plus variety in your fruit. Not the best I’ve made! The Grow sculpture in Canberra city- by Stephen Short.